यूं ही कुछ पाने की चाह मे! Mamaearth has become a well-known brand now. 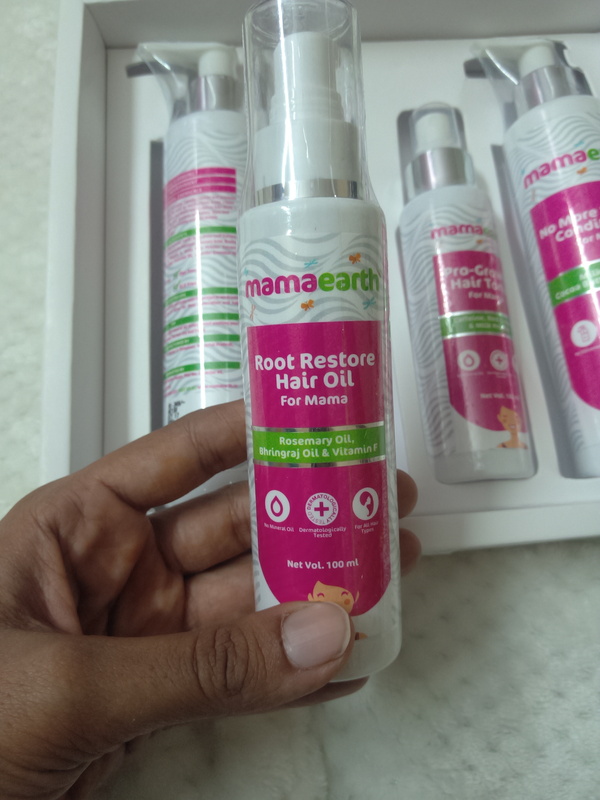 Starting from their baby care range to traditional recipes not to forget the mamaearth skin care range, Mamaearth has been keeping its promise of providing us with 100% toxin free and natural products. 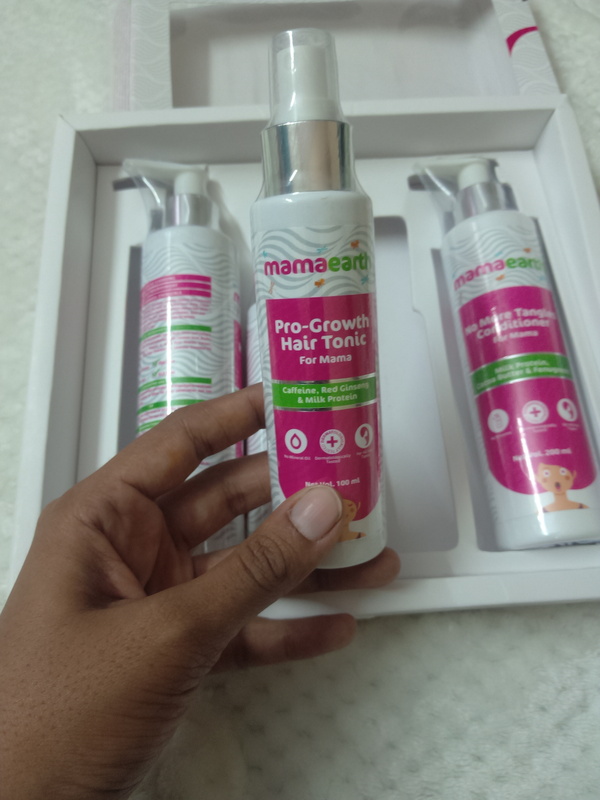 This time mamaearth brings to us a special range of products that all moms need the most especially after their delivery, a very special hair care kit. After delivery, one of the most dreaded thing that we face is the hair loss. I remember, how much I used to cry every time I used to comb my hair. It’s such a pain to see your beautiful hair lying on the floor. How thin they become and how dull they start looking after a few months post-delivery! Mamaearth seems to understand moms too well. For that’s the reason they have come up with a most amazing kit to deal with all our hair woes. Even after so many years after delivery, I cannot say that my hair are the same as they used to be. One of the major reason is that I don’t get the time to visit a salon very often and with two kids, I simply forget to even look at them. Welcome to motherhood! Root Restore Hair Oil has coconut oil, olive oil, orange oil, rosemary oil, palmarosa oil, evening primrose oil, jojoba oil, bhringraj oil and vitamin E as its key ingredients. It helps in strengthening the roots, provides nourishment and repairs damaged hair. It is Paraben free, Phthalates free, dye free and SLS free. It comes in the form of a clear liquid and has to be applied evenly from the roots till the end. Being herbal and therapeutic in nature it helps reducing all the hair problems. 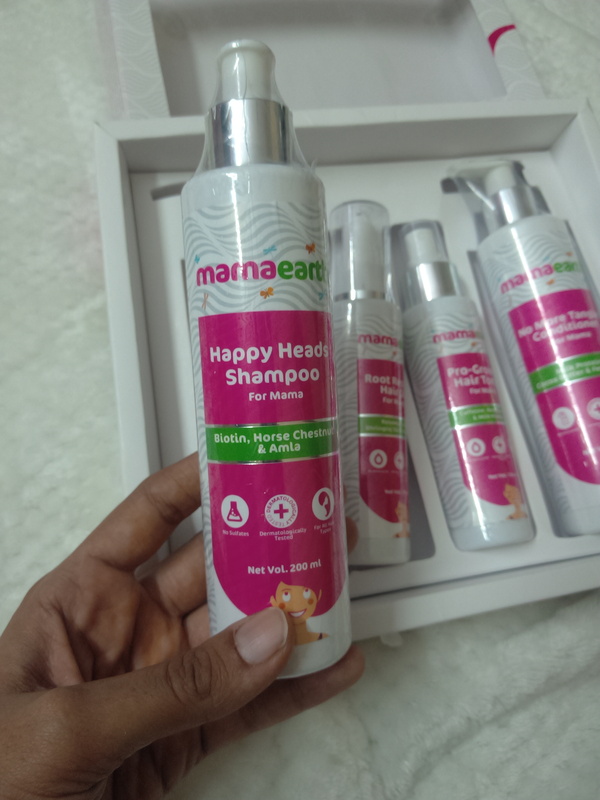 Happy Heads Shampoo contains biotin, horse chestnut and amla as its key ingredients. It is free from harsh chemicals and very gentle in nature. It is in the form of a clear liquid with a mild fragrance that retains in the hair for quite some time. Even though it is mild in nature but it cleanses the hair thoroughly, which I feel is the best part. It forms good lather but one needs to wash twice if using after hair oil. It does not cause any dryness to the hair. With the kind of neglect that our hair go through especially after becoming a mom, this conditioner comes to our rescue. Our hair become so rough and dry that they easily form tangles. 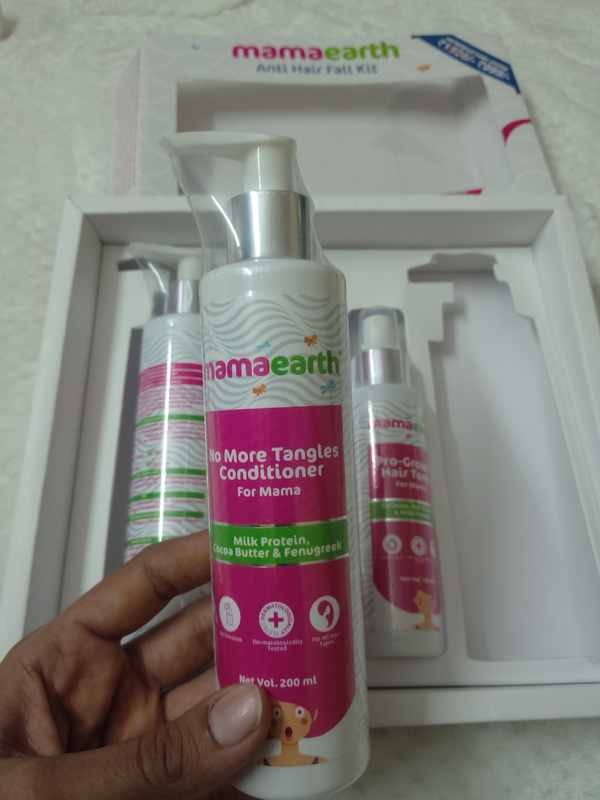 Mamaearth’s No More Tangles Conditioner contains milk protein, cocoa butter and fenugreek. It makes the hair naturally soft and silky. It moisturises the hair and strengthens them. It spreads easily and has to be applied from the roots till the end. With caffeine, red ginseng and milk protein and being free from all the harsh chemicals, this is a must have product for all the moms. It is mainly for strengthening hair roots, improving density of thee hair and reducing hair fall. It has to be applied on the roots. It is non sticky and very light. A regular application helps in visible results. After using the products in the kit regularly for over a week, I can see a difference in my hair. There is a natural bounce and shine. The limpness is gone and they look healthier. The kit is available at their official site as well as the leading online stores. Recently, my daughter was required to bring disposable glasses for a school event. I gave her small disposable glasses but was feeling sceptical as to how small kids will manage with those flimsy and leaky disposable tablewares. Disposable table wares have become an essential part of our lives. Be it for birthday parties, school picnics, get together or travelling with kids. These are something that are slowly becoming a necessity for us. Plastic disposable table wares are known for the potential threat they are causing to our environment and also for our health, whereas paper disposable are pretty flimsy and leaky. They often become a nuisance for the spillage that they cause. For some time I have been looking for some alternative which should be sturdy and eco-friendly too. 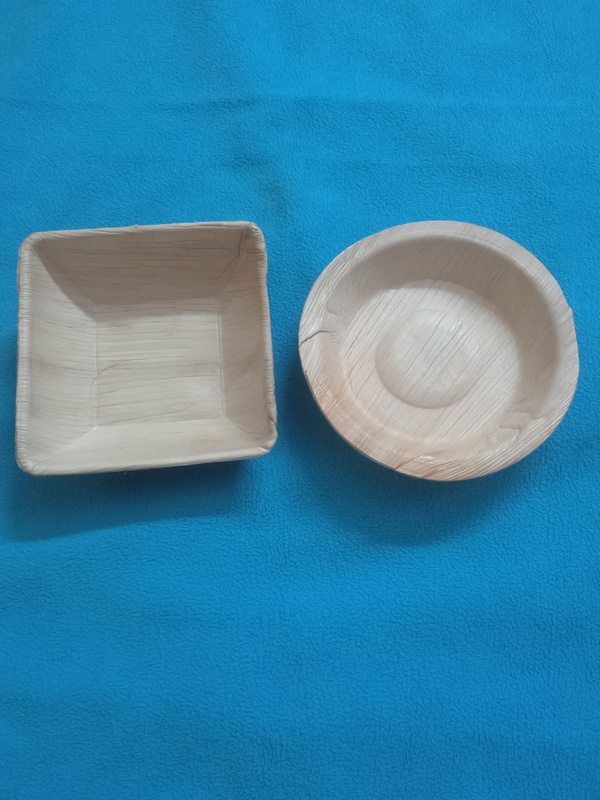 I came across a video which showed disposable table wares made from fallen palm leaves. What’s more they are made in our own country. No trees are cut or leaves taken from the trees but these are made from the leaves of palm trees which fall on the ground. 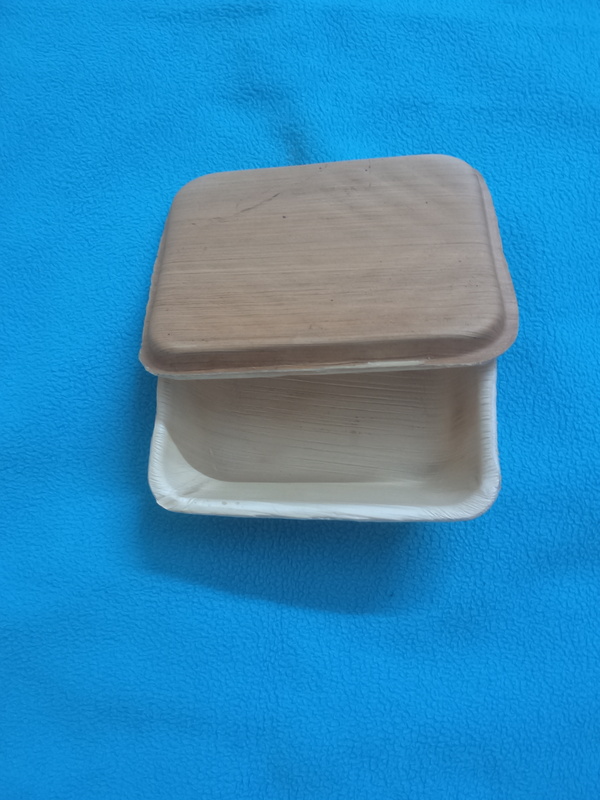 When I came across Greenfare, a brand which makes disposable table ware from areca tree leaves, I immediately fell in love with their products. 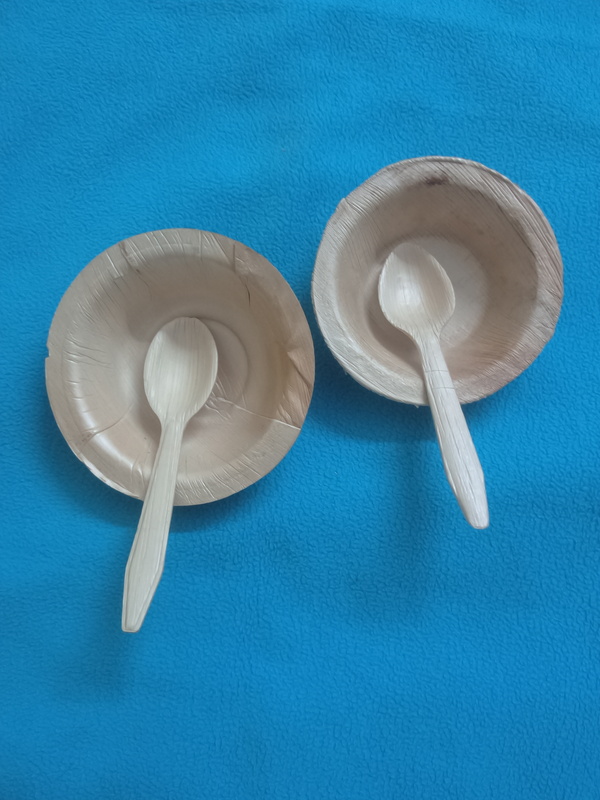 The disposable table wares are made out of dried and fallen leaves of areca trees. These table wares are stylish, sturdy and beautiful. These disposable wares are 100% biodegradable, compostable and eco-friendly. They do not break even if they fall on the ground. The best part is that they are chemical free, food safe, freezer safe and microwave safe. They come in beautiful shapes and the colour of natural areca leaves looks especially classy. Harsha Sharma, the founder of Greenfare is a dreamer, a believer, dynamic and a sensitive person. Her love for Earth has incepted Greenfare. I love these products for their sturdiness and the fact that they are biodegradable. Their quality is very good. They are made 100% naturally and are chemical free. They have a food box which comes with a lid. It can be used to carry dry snacks. The size of the wares is quite appropriate. So, we can now say goodbye to those flimsy and leaky plastic and paper disposable table wares and switch over to Greenfare disposable wares. Adventures in Farland is a book written for young readers between the age group of 6-15. The book is based on fantasy fiction. The story revolves around a young girl called Mira who chances upon to meet, Bushy from Farland and is invited to the New Moon Party by Princess Harmonica. Farland is a magical place about which Mira has heard stories from her mother. The gnomes, the fairies, the toads, the eagles and many other strange characters live in Farland. Mira gladly accepts the invitation and is taken to Farland by Starlight, the best pilot of Farland. It was like a dream come true for her. She was travelling to a place she had heard about in the stories and was believed to be a fairy-tale. It was then that her adventures begin. She comes to know how the land of Farland is under danger by a witch who wants to destroy everything. Even though, she is a complete stranger to the place, Mira agrees to help the people of Farland. During her mission to save the land, she visits some of the most fascinating places and meets some of the strangest creatures. Will she be able to save the beautiful land of Farland? The book portrays some very interesting and magical creatures. The Characters are very interesting, curious and relatable. The character of Bushy, for example, is very strange too. He has a bush on his head instead of hair. The character of Mira is portrayed as a beautiful, brave and kind hearted girl. She thinks wisely and acts bravely even at the most crucial moments. She remains calm and composed throughout her adventures. 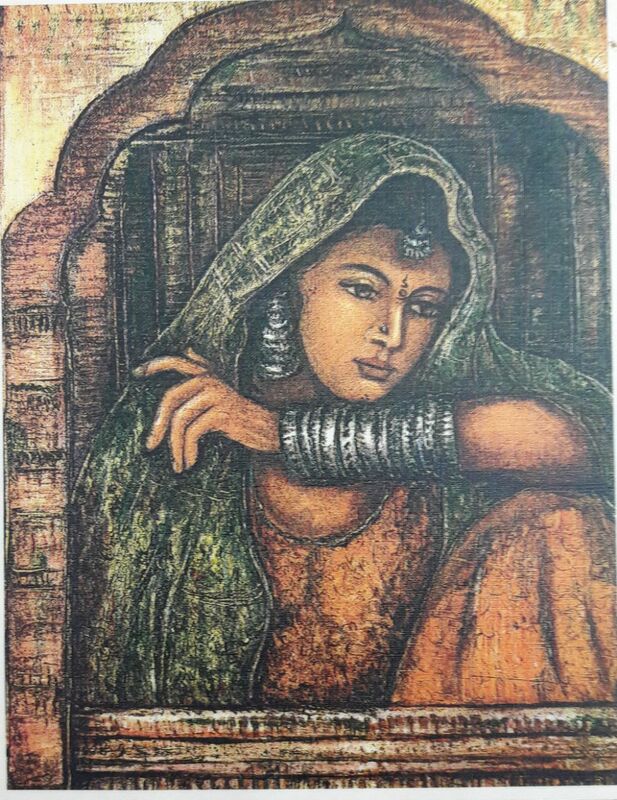 Mira was accompanied by her two friends, Vira and Bira, the twin brothers who constantly kept quarrelling. They were turned into rats by Bushy so that they do not disturb the party. Some other interesting characters of the book are Starlight, Queen Halo, Princess Harmonica, Ugly the Giant and the Windman. The narrative of the book is very gripping from the beginning till the end. The imagery used in the book is very vivid providing enough room for imagination to the young readers. The imagery used is very descriptive and vivid. The reader can visualise the story very clearly. The language used is very simple with some new words to enhance the vocabulary of its targeted audience. The use of song in the train sequence helps lighten the tension building up during the sequence of events. The element of suspense holds the curiosity of the readers till the very end. There is never a dull moment during the flow of the storyline. The story comes with morals too by the way of the characters. The way the twins were punished and turned into rats and the way Mira acted bravely and wisely provides a lesson to the young readers. The book is written by Moshank Relia, a graduate in English literature with a love for children and story writing. Moshank is passionate about photography and trekking and holds certificate in creative writing, theatre and sketching. It is the first book written by him. His art of storytelling and the ability to hold his audience can well be seen in the book. The way he has crafted the story and the sequence of events in the book makes the reader asking for more. I am very thankful to him for providing me with an opportunity to review his book. The minute I started reading the book, I could not put it down. It was almost as if I could see it happening right in front of me, making me a part of the journey. When I told my daughter about the storyline of the Adventures in Farland, she became very excited. She is asking me for the book everyday which shows the suitability of the book for its aimed readers. The book is sure to capture the imagination and curiosity of the children. I am eagerly looking forward for the launch of the book on Amazon on the 19th of this month. Recently, I was talking with my daughter about the games we used to play during our childhood. One of the many outdoor group games that we used to play was “Poshampa bhai poshampa”, then I realised that I have forgotten a few words in between of this very famous and sweet song of my childhood. Last week, I received a beautiful gift from T4Tales, a children’s book publisher for a review. To my surprise I found the good old songs of my childhood in it. And guess what, it even has, my favourite “Poshampa bhai Poshampa”. I was so excited that I called my daughter and said, “Remember I was trying to sing this song few days back and I told you that I have forgotten it. See, this book has my favourite song and the other songs too which we used to sing.” We sat down together and sang all the songs of my childhood. I felt as if I was a little girl again and singing the songs with my best friend. During those few moments, I and my daughter were two best friends of the same age group. We giggled, we smiled and we laughed and hugged each other just like two little girls. 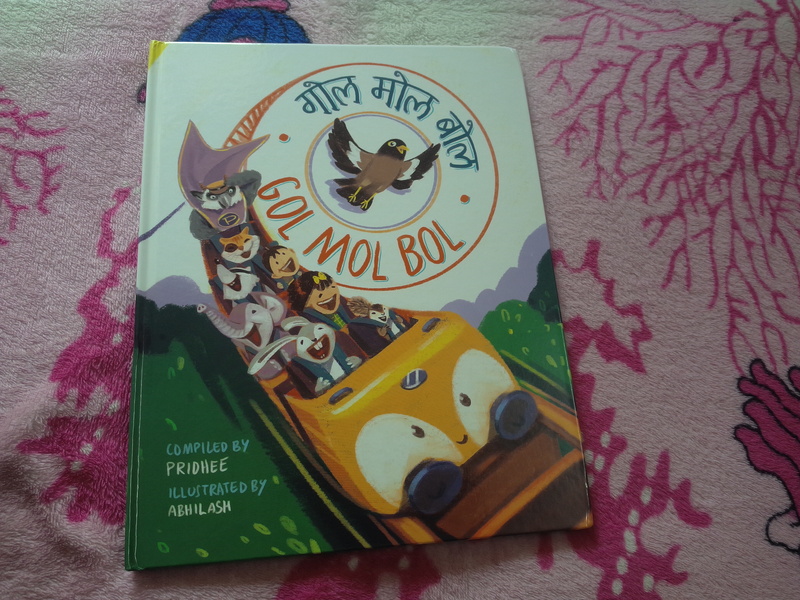 The book called “GOL MOL BOL” compiled by Pridhee and illustrated by Abhilash is a beautiful and colourful hard bound book containing old Hindi Rhymes. The illustrations are big, beautiful and full of childhood innocence. 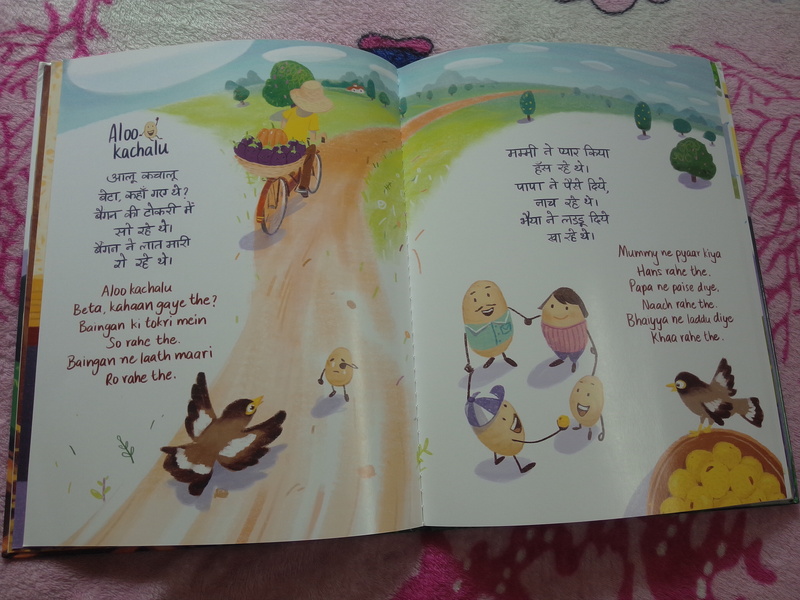 The best part of the book is that the rhymes are written not only in Hindi script but in English script as well. 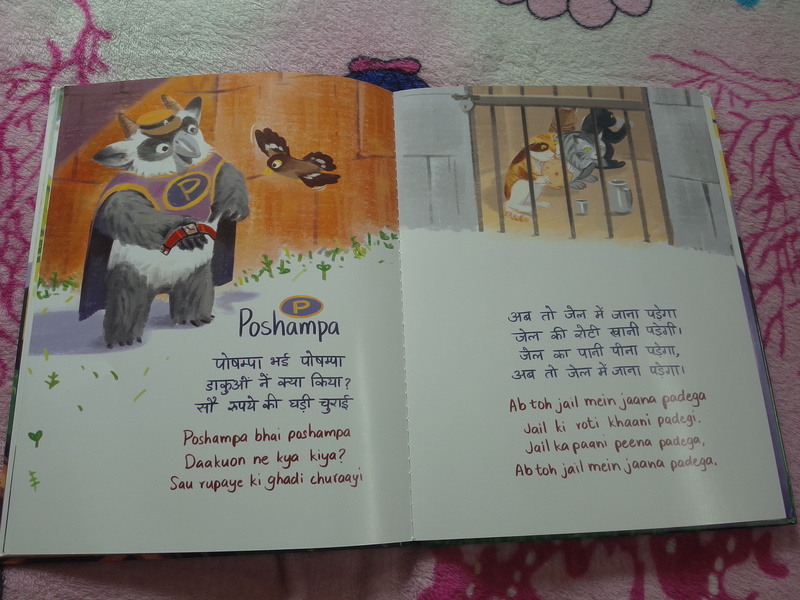 The songs are not translated in English but transliterated to help young readers learn Hindi language. While reading the book I realised that we start teaching English language to our children at a very young age. We start drilling English alphabets, we converse with them in English and prefer reading books written in English right from the very beginning. With the result that they become proficient in English from a very young age. But what about our own Indian Languages and especially Hindi? Kids, these days are not as comfortable in reading and writing Hindi as they are with English. T4Tales brings to us books written in Hindi with English transliteration. It helps young learners who can easily read English with phonemes to read and learn Hindi language. The English transliteration enables them to pronounce the words correctly and help them enjoy the rhythm of the songs. T4Tales offers books for young learners those who are between 0-4 years of age. They help introduce Indian Languages, such as Hindi, Punjabi and Kannada, to help children in their early years. They offer old Indian rhymes that have been passed down to us by our elders and thereby help our children connect with their roots. The author of the book, Pridhee Kapur Gupta, is a mother of a 4 year old, writes books for young children in Indian languages. A trained molecular biologist with a PhD from Germany, Pridhee has an undergraduate and masters degree from IIT-Delhi, and has taught at Macquarie University, Australia. Her journey in book writing began after becoming a mother when she realised that there were not enough children’s books in Indian Languages available outside India. That’s when she decided to pen down books on her own. Apart from the bright and colourful illustrations, the content and the bilingual feature of the book, there is also a very special feature adding a new dimension to the book is the pop up page. 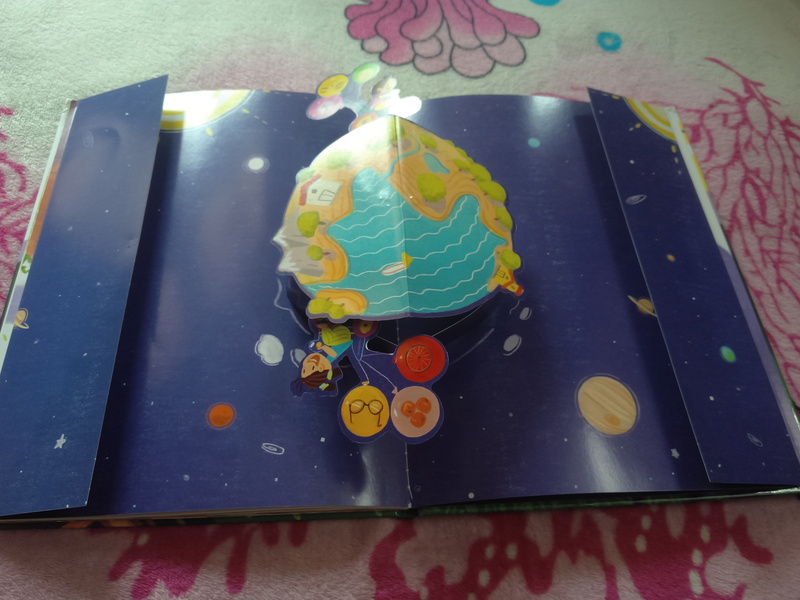 There is a pop up page provided at the end of the book with the rhyme “Chanda Mama Gol Gol”. It adds a special flavour to the book and easily enraptures the young readers.